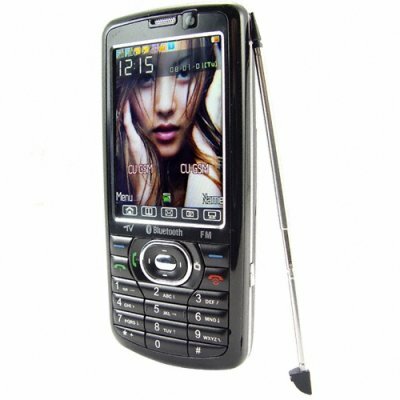 Successfully Added Quadband Dual SIM Multimedia Touchscreen Accelerometer Cellphone to your Shopping Cart. Quad band dual-SIM + dual-standby multi media touch screen cell phone with accelerometer motion sensor function for added convenience. This quadband (850Mhz, 900MHz, 1800MHz, 1900Mhz) mobilephone has an impressive feature set ensuring you have a great multimedia experience with its advanced on-board digital technologies including touchscreen and accelerometer. The fully unlocked, native quad band GSM functionality of the mobile phone is further enhanced by the fantastic two SIM card slots, ensuring maximum connectivity wherever you go with global roaming. With its candy bar form factor, this is an easy to use cellphone for calling and messaging, while at the same time providing a rich multimedia experience and effortless, user-friendly navigation menu system. The included stylus provides a responsive and convenient way to enter characters and perform precision tasks on this superb handset. The multimedia features of this phone include analog TV, FM radio, digital cameras, photo viewer, digital video camera, MP3 and MP4 players - all complemented by an impressive 2.6" TFT color display and stereo speakers. The cellphone also comes with Bluetooth connectivity with A2DP + AVRCP, a spacious phonebook for up to 500 contacts while the built-in accelerometer neatly rounds off the impressive feature set. Secure some new sales for yourself by stocking up on this new phone to sell at your online / physical store or feature it in your latest eBay, Amazon or uBid listings and use our reliable blind dropshipping service to maximize your limited resource of time. Here at Chinavasion we believe in taking the stress out of e-trading. Quad band phone with Dual-SIM with Dual-standby for calling and messaging convenience around the world.